A new, autumn fruiting raspberry, raised by East Malling Research Station. A very heavy cropping variety. It fruits earlier from August to late September with high quality berries and a good flavour. The canes are short, very sturdy and will not normally require support. Autumn Bliss gives more than double the crop of other autumn fruiting types and has good aphid resistance. 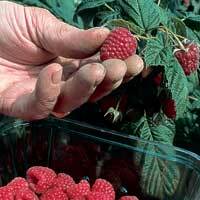 An interesting variation on growing raspberries is to grow Autumn Bliss in polythene tunnels or under glass. This gives a very prolonged crop. Raspberries for Christmas? All Ministry certified. Very highly recommended.